We’d love your help. Let us know what’s wrong with this preview of Quiet as a Nun by Antonia Fraser. To ask other readers questions about Quiet as a Nun, please sign up. My second time to read an Antonia Fraser (born 1932) book. My first by her was a biography, Marie Antoinette: The Journey (4 stars). Lady Antonia Fraser is the widow of Harold Pinter (1930-2008), the 2005 Nobel for Literature winner. Although I liked this book, I thought that Lady Fraser was a better biographer than a detective/thriller novelist. This book gave birth to Fraser's investigative lady journalist, Jemima Shore whose childhood friend Rosabelle Powerstock is found dead inside the tower My second time to read an Antonia Fraser (born 1932) book. My first by her was a biography, Marie Antoinette: The Journey (4 stars). Lady Antonia Fraser is the widow of Harold Pinter (1930-2008), the 2005 Nobel for Literature winner. Although I liked this book, I thought that Lady Fraser was a better biographer than a detective/thriller novelist. There is actually an irony in the title because even if the nuns are quiet while praying, the politics and secrets inside the convent are disquieting. I've read novels about those controversial events inside the house of God, e.g., altars, seminaries and convents. Reading something as old as this book, originally published in 1977, gives one a feeling that time has not really changed even many decades or centuries ago. However, I think what makes this book different from the usual whodunnit thrillers is that the character of Jemima Shore parallels that of her friend, Sister Miriam. They are both feminists in the 70's when most women were still expected to be domestic homemakers. If Sister Miriam, wanted to assert her own personality instead of to be just one of the "nuns dressed in black," Shore wanted to grow as a journalist and be her own person. Both did not want to suffer in silence, i.e., quiet as a nun but rather air their voices out. Reader I enjoyed this story.... A case of possible murder in a girls convent school.... Written in the late 70's Fraser felt no need for extreme descriptions of violence and, while raising the possibility of "particular friendships" decides not to muddy the waters too much keeping the plot relatively simple. Having attended a school run by nuns, two of whom abandoned the habit late in life as a courageous gesture of protest against attempts to move the school firmly into the private sector, I fo Reader I enjoyed this story.... A case of possible murder in a girls convent school.... Written in the late 70's Fraser felt no need for extreme descriptions of violence and, while raising the possibility of "particular friendships" decides not to muddy the waters too much keeping the plot relatively simple. Having attended a school run by nuns, two of whom abandoned the habit late in life as a courageous gesture of protest against attempts to move the school firmly into the private sector, I found the story appealing on several levels. An interesting plot well written but also encouraging the reader to engage with some thorny issues around property and land ownership. This was just ok. I had a really hard time getting into this story and I think it was mainly due to the author's slightly strange writing style. A lot of her sentences felt more like fragments to me than actual sentences and I found myself having to re-read passages quite a bit to make sure I was following the story. It wasn't especially heavy prose - it was just strangely written. The story itself was kind of a cute mystery but was never all that suspenseful or scary. Lastly, and on a personal This was just ok. I had a really hard time getting into this story and I think it was mainly due to the author's slightly strange writing style. A lot of her sentences felt more like fragments to me than actual sentences and I found myself having to re-read passages quite a bit to make sure I was following the story. It wasn't especially heavy prose - it was just strangely written. The story itself was kind of a cute mystery but was never all that suspenseful or scary. I thoroughly enjoyed this book, I read it when it was first published but could not remember the outcome of the mystery. The novel is set in Blessed Eleanor's Convent, a girls' school of which Jemima Shore, 'investigator' was a former pupil. When Sister Miriam, an old schoolmate of Jemima, is found dead, the headmistress, Mother Ancilla asks Jemima to return to the school and try to ascertain exactly what is going on. After some deliberation, Jemima decides to stay at the convent and do a little I thoroughly enjoyed this book, I read it when it was first published but could not remember the outcome of the mystery. The novel is set in Blessed Eleanor's Convent, a girls' school of which Jemima Shore, 'investigator' was a former pupil. When Sister Miriam, an old schoolmate of Jemima, is found dead, the headmistress, Mother Ancilla asks Jemima to return to the school and try to ascertain exactly what is going on. After some deliberation, Jemima decides to stay at the convent and do a little detective work. This leads her and some of the staff and pupils into some very dangerous situations and the reader is left wondering who the source of evil can be in this holy house. Surely not one of the nuns and the students seem too young, but someone is a ruthless killer and Jemima needs to find out who before they strike again. Far-fetched, contrived, weak plot, boring characters, insipid dialogues, corny suspense (dark crypt, coffins, etc.) The famous TV investigator heroine doesn't have one interesting thought throughout the book - even her messages to her (married - is that what is supposed to make her interesting ?) boyfriend are unimaginative. A thriller set amongst nuns in a cloistered, sheltered world, at least that is what one thinks at the beginning. 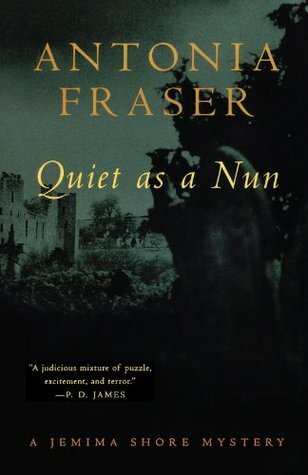 But Ms. Fraser leads us to discover that these nuns are in reality as flesh and blood, also as quirky and eccentric, as any people we come across in our lives. The mystery is twisting, the writing is witty and clever (making one laugh outloud), the social commentaries are numerous and theology questions abound. I begrudge not one minute that I devoted to this read. Recommended to Sylvie by: No one. Picked it up at the public library. Frankly, it's boring. I got about halfway through the book then gave up. Antonia Fraser's works of nonfiction are excellent scholarly works, but if she's written other novels, and they're anything like Quiet as a Nun, then I'm going to stick with her nonfiction books! I really enjoyed this! I have read many of Fraser’s non fiction, and was surprised to find this in a used bookstore. It was a very well done mystery for under 200 pages. This was a series and I’ll be on the look out for her others. 68. Quiet As A Nun by Antonia Fraser. Jemima Shore spent many school years as a student at the Blessed Eleanor's Convent. There she became good friends with fellow student Rosabelle, the daughter of the wealthy family who owned the land the convent stood on. When the two girls graduated their paths diverged, with Jemima becoming a famous television investigator and Rosa becoming a nun. Years later, Jemima finds herself back at the convent to try and discover what drove her friend to lock herself 68. Quiet As A Nun by Antonia Fraser. Jemima Shore spent many school years as a student at the Blessed Eleanor's Convent. There she became good friends with fellow student Rosabelle, the daughter of the wealthy family who owned the land the convent stood on. When the two girls graduated their paths diverged, with Jemima becoming a famous television investigator and Rosa becoming a nun. Years later, Jemima finds herself back at the convent to try and discover what drove her friend to lock herself in the convent tower and starve herself to death, and if the stories of the ghostly Black Nun of the convent are true. This book was a fast read but not engrossing. The mystery was predictable and I was put off by the way the nuns were portrayed. I never got the sense that the author understood what it means to be a nun or a Catholic. I suppose this should be fine as the heroine is neither, however, it detracted from the quality of the story for me. I found myself just wanting to finish the book so I can move on to another. I really like what I've read of Fraser's work as a historian, but this was a very frustrating novel; it was both unsatisfying as a mystery and the prose while usually competent sometimes became quite annoyingly bad. I am going to try another one of her books, though, in the hopes that she has improved as a novelist with practise. This is one of those books I'm reading to the end because I started it. It's not good. A nun apparently starved herself to death in a tower. "Television reporter Jemima Shore is a former schoolfriend of Sister Miriam, who was also known as Rosabelle Powerstock and was heiress to "the Powers fortune", one of the largest fortunes in Britain. Jemima is invited back to the convent by Reverend Mother Ancilla, where she uncovers a number of mysteries, including the suggestion that Miriam, whose family owned the convent lands, may have written a second will bequeathing them away from the A nun apparently starved herself to death in a tower. "Television reporter Jemima Shore is a former schoolfriend of Sister Miriam, who was also known as Rosabelle Powerstock and was heiress to "the Powers fortune", one of the largest fortunes in Britain. Jemima is invited back to the convent by Reverend Mother Ancilla, where she uncovers a number of mysteries, including the suggestion that Miriam, whose family owned the convent lands, may have written a second will bequeathing them away from the Order, and into the hands of another charity." Found this little book at a thrift store in Spain for 2 Euros. I was desperate for books in English at the time, so I bought it. I was surprised at how well written and suspenseful this book was. The characters developed fluently and the story was quite interesting. This would be a great book for young readers to build vocabulary and foster an interest in reading. Interestingly enough there are a lot of books written by Fraser based on the protagonist Jemima Shore, who knows maybe I will find th Found this little book at a thrift store in Spain for 2 Euros. I was desperate for books in English at the time, so I bought it. I was surprised at how well written and suspenseful this book was. The characters developed fluently and the story was quite interesting. This would be a great book for young readers to build vocabulary and foster an interest in reading. When a murder takes place in a secluded tower at Blessed Eleanor's Convent in Sussex and the victim is an old school friend, Britain's most popular TV reporter Jemima Shore finds herself in the middle of a disturbing puzzle. The dead woman, a nun, was to inherit one of the largest fortunes in Britain. Jemima walks into the eye of a worldly storm of fear - and the more she learns, the clearer it becomes that more lives, including her own, are being threatened. Just reread this oldie for my Crime and a Cuppa series. This is the first in a series by Antonia Fraser better known for her lengthy biographies. It’s a nice introduction to the characters and if I remember correctly the books get better as the series grows. Dated, of course, but not yet reaching the status of historical, at least in this old lady’s view. Jemima Shore, one of Britain's most popular reporters, is asked to investigate the death of a nun at Blessed Eleanor's Convent in Sussex. The victim was a school friend of Jemima's and the heir to a tremendous fortunes and so there is great interest in the case. The first book in a series. Wasn't thrilled with this one. I felt it was all over the place, literally; within one paragraph locations would shift, as well as time-it was difficult to follow. I also figured out very early one who the black nun was and where the second will was hidden, so there was no great mystery. Solid mystery! A nice blend of history, intrigue, sort of Agatha Christie-like. Synopsis: when a murder takes place at Blessed Eleanor's Convent, the victim is a friend of Britain's popular TV reporter Jemima Shore. My first time with this author. Spoiler: not sure I'll continue with the series since our heroine is yet another fool hopelessly in-love-with-a-married-man, which I find sad and discouraging.